[153 Pages Report] The automotive battery thermal management system market is valued at USD 1.01 Billion in 2016 and is projected to reach USD 4.24 Billion by 2025, at a CAGR of 16.05% during the forecast period. The base year for the report is 2016 and the forecast period is 2017 to 2025. The research methodology uses secondary sources that include associations such as International Organization of Motor Vehicle Manufacturers (OICA), Emission Controls Manufacturers Association (ECMA), European Automobile Manufacturers Association (ACEA), Environmental Protection Agency (EPA), and International Council on Clean Transportation (ICCT) and paid databases and directories such as Factiva and Bloomberg. In the primary research stage, experts from related industries, manufacturers, and suppliers have been interviewed to understand the present situation and future trends in the automotive battery thermal management system market. The automotive battery thermal management system market for OE has been derived from forecasting techniques based on electric & hybrid vehicle sales, hybrid system penetration, and electric vehicle regulations and incentives. 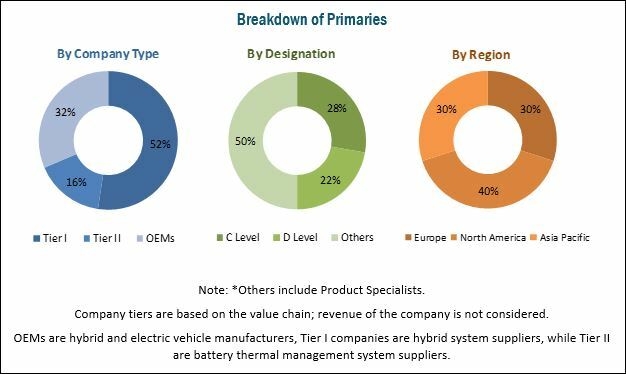 The ecosystem of the automotive battery thermal management system market consists of battery thermal management system manufacturers such as LG Chem (South Korea), Continental (Germany), GenTherm (US), Robert Bosch (Germany), Valeo (France), Calsonic Kansei (Japan), DANA (US), Hanon Systems (Korea), Samsung SDI (Korea), Mahle (Germany), VOSS Automotive (Germany), CapTherm Systems (Canada), and others. The automotive battery thermal management system market is projected to grow at a CAGR of 16.05% during the forecast period, from USD 1.29 Billion in 2017 to a projected market size of USD 4.24 Billion by 2025. The key growth drivers are the increasing demand for electric vehicles and the integration of automotive battery thermal management system with other electric thermal management systems. Also, secondary factors such as government subsidies for BEVs and investments in charging infrastructure will fuel the demand for automotive battery thermal management system in the coming years. The active technology of automotive battery thermal management system market is expected to have a higher adoption rate in the near future. 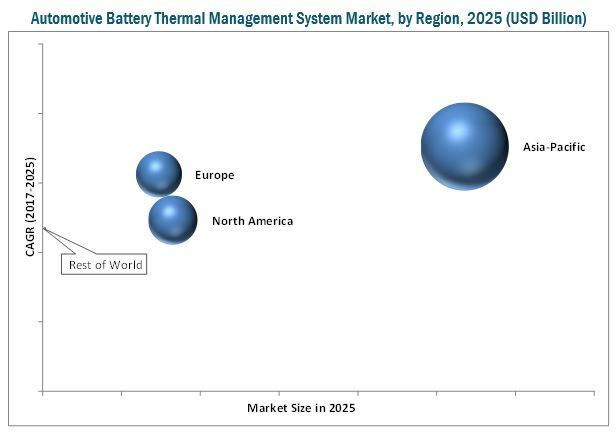 Factors such as the increased efficiency, improved battery performance, and long lifespan are expected to drive the demand for active technology in the battery thermal management system market. Active technology, which uses air or liquid for heating or cooling the battery cells, has enabled the developers and manufacturers to get maximum efficiency and performance with extended battery life. Asia Pacific is estimated to be the largest market for automotive battery thermal management system owing to the increasing sales of electric vehicles in countries such as China and Japan. The electric vehicle sales in China and Japan are expected to increase from 0.49 million units and 1.09 million units in 2016 to 2.17 million units and 2.1 million units in 2022, respectively. The Chinese government’s move of working on a timetable to end the production and sales of gasoline as well as diesel cars is expected to increase the market of electric vehicles in the region. Likewise, the Japanese government’s “Next-Generation Vehicle Strategy 2010” aims at increasing the market share of electric vehicles to 50% of the total vehicle sales by the end of 2020. Thus, the market for automotive battery thermal management system market is also slated to increase with the increasing sales of electric vehicles in the region. The passenger vehicles segment is projected to hold the largest market share during the forecast period. The growth of this segment can be attributed to the various initiatives by government bodies to improve EV adoption rate across the world. The growth can also be attributed to the high growth projections of BEVs and PHEVs in several countries. China, for example, has an ambitious plan of going all electric by 2025. Both these vehicle types have a major market share in the passenger vehicle segment. Hence, this segment is expected to experience the highest growth during the forecast period. The <100 kWh battery segment is estimated to hold the largest share of automotive battery thermal management system market during the forecast period. The <100 kWh battery segment holds the largest market share due to the growth of plug-in hybrid, hybrid vehicle, and fully electric vehicle. The manufacturers are trying to make a low-cost battery thermal management system that can help to reduce the overall price of the electric vehicle and make it available in the mass market. The market for <100 kWh battery is projected to remain the largest in the automotive battery thermal management system market. The key factor that restrains the growth of the market is the design complexities in components used for battery thermal management system. There are no specific industry standards or specifications architecture available. The components and architecture can be standardized to decrease the R&D cost of developing the automotive battery thermal management systems. However, standardizing the system components is difficult for the manufacturers, which thus restrains the growth of the market. The automotive battery thermal management system market is dominated by a few global players and comprises several regional players. Some of the key manufacturers operating in the market are LG Chem (South Korea), Continental (Germany), GenTherm (US), Robert Bosch (Germany), Valeo (France), Calsonic Kansei (Japan), DANA (US), Hanon Systems (Korea), Samsung SDI (Korea), Mahle (Germany), VOSS Automotive (Germany), and CapTherm Systems (Canada).